R. Crumb's "A Short History of America" poster. 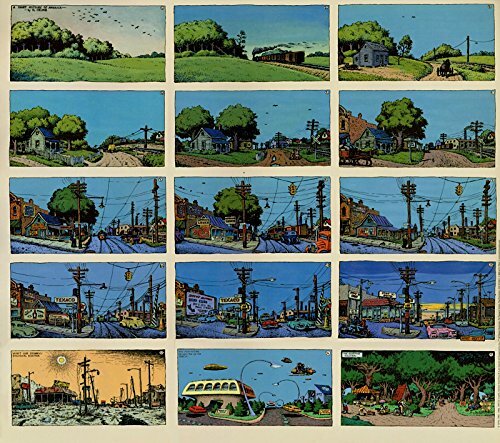 Arguably cartoonist Robert Crumb's most popular and most timeless image, this poster shows the gradual metamorphosis of a single plot of land from virgin wilderness to urban decay in 12 panels. It first appeared in black & white in 1979 in the ecological magazine Co-Evolutionary Quarterly and in Snoid Comics. It was rearranged and colored by Peter Poplaski in 1981 and quickly became Kitchen Sink Press' best-selling poster. After the popular but depressing 12-panel poster went out of print, Crumb added three panels to answer the "What next?" question posed in his original final 12th panel. In this 15-panel version Crumb depicts three possible futures: a.) Lower left shows the "Worst case scenario: ecological disaster; b.) Center: "The fun future: Techno fix on the march!" c.) Lower right: "The ecotopian solution." Measures 22 inches high x 24 inches wide. 1997 printing on coated stock. We will not fold this item: Shipped rolled in sturdy tube. a.) Lower left shows the "Worst case scenario: ecological disaster; b.) Center: "The fun future: Techno fix on the march!" c.) Lower right: "The ecotopian solution." If you have any questions about this product by 22" x 24" Poster, contact us by completing and submitting the form below. If you are looking for a specif part number, please include it with your message.